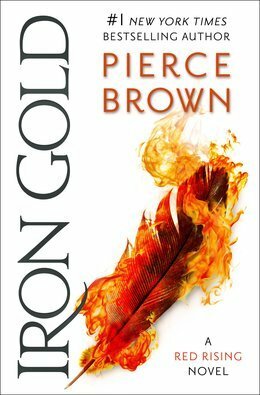 Iron Gold is the fourth in Pierce Brown’s ‘Red Rising’ series. It takes place several years after the previous trilogy, showing both us and the characters what happens after a war for liberation is won. It’s not all roses, by any means. The universe of Iron Gold is distinct from that of the precursor series. The Golds, mankind’s erstwhile masters, have been driven to the core and edge of the solar system. In between, a Republic rules. The society of the outer Golds is one which can evoke some sympathy. Where previous entries gave us sybaritic rulers, interested more in their rights than their assumed responsibilities, those at the boundaries of things hold to a different moral aesthetic. If they still regard the other classes of their population as inferior, they do so with a sense of parental duty, forces of occasionally brutal guidance, rather than feckless waste. These are the Iron Golds, those who are prepared to back their claim to superiority in blood and fire, and accept that loyalty is a two way street. They’re sympathetic, to some degree, with the courage of their convictions and a willingness to see them through. By contrast, the Republic, founded by the heroes of the series prior – Darrow and the rest – is something of a lame duck. Or perhaps a sick horse. A senate packed with jobsworths and useful connections debates the worth of further war whilst being insulated from it, while the military looks to its commanders for instructions, and for leadership if the orders it’s given aren’t the right ones. Pierce Brown crafts a convincingly fledgling republic out of whole cloth. Its institutions are new, and in many cases, may be as corrupt as what they’re replacing. Where the existing social support network has been ripped away, often by violence, the consequences are harrowingly portrayed. If the original trilogy showed us that idealism and will can triumph over embedded hostile interests, Iron Gold shows that this sort of action has a cost. Social upheaval is as likely to bring suffering as benefit, and more likely to impact those at the bottom of the existing strata. This is the start of a story about consequences, and about the danger of assuming happy endings. Idealism let the protagonists drive a social change, and bring a Republic into being over a degenerate aristocracy. But it turns out that building and sustaining a society is more difficult than tearing one down. Iron Gold keeps the neo-Romano themes of the original trilogy as well. The senate of Darrow’s Republic has classical undertones, and the society of the Golds on the outer edges of the system is one which carries the social virtues of duty and honour, and the sense of fatal consequences for dereliction of either. This society serves as a fascinating backdrop to the adventures of the characters, both returning and new. Darrow, of course, we know from the original series, though now with a few more edges knocked off as time has passed. In his role as The Reaper, he’s still an idealist in the cause of freedom, as well as an elemental force of rage in its service. But that role doesn’t sit quite as well here, where Darrow is also a family man. It’s wonderful seeing him involved with his immediate and extended family – the warmth, compassion and loyalty flowing through these interactions is palpable. It serves as a contrast to the swift, brutal action Darrow is willing to take in the field – and helps to expose the internal conflict in Darrow’s soul. It may be that the world he has built no longer has a place for monsters in it. On the other hand, Darrow may be unwilling to go quietly into the night, and let others pick up what he’s built; whether that’s the right decision or not is something he’s conflicted over, and I had a sense of a man fighting to relive the conflicts of the past in the battles of the present. On the other hand, Darrow is clever, loyal, and an excellent tactician. The weight of the previous books is here, playing on reader expectations. After all, we’ve seen our hero do some seemingly disastrous things for a later purpose - but that may not be the case here. The issue of whether Darrow has accomplished his goals and should pass the torch is a key segment of his journey through the text – selfishness wrapped in a selfless coating, or vice versa. This is a text which is unafraid to discuss the slow failing (or otherwise) of old heroes. In that vein, we also get to spend some time with Lysander, once heir to the Gold society centred on the moon, and now a wandering vagabond of sorts. Lysander serves as a nice counterpoint to stories of decadent, oppressive Golds. He’s often warm, empathetic, and willing to at least consider the way in which society has been structured to his benefit. At the same time, there’s an incisive intelligence and a youthful energy which dance off the page, making him an engaging protagonist – one whose insecurities, flaws and virtues are held in balance by the reader. If Darrow is part of the old guard, bringing about a new ociety, Lysander is one of the consequences – freed of responsibility, but looking for a cause of his own, willing to accept change, but also to hold onto some of the history which Darrow and his acolytes see only as sclerotic remnants. Lysander is someone we can learn alongside, and seemingly a principled, even-tempered voice in a world shaped by the dying grudges of the previous generation. Much like Darrow, his internal conflicts and contradictions help to provide depth, a portrait of an adolescent troubled by expectations – his own, and others. It’s to the author’s credit that Lysander is someone the reader can empathise and sympathise with, eve as Darrow, the older hero, works to undermine and destroy the society Lysander is a part of. If Darrow and Lysander give us high level politics, by means of debate and violence – then the other new actors in this drama give it heart, and a grounding which is needed in a world where men duel with razorwhips in armoured suits on finer points of honour. Lyria is, as Darrow was, a Red. His great efforts to reshape the world and bring freedom to his people have mostly brought her pain. When the social order shattered, so did infrastructure for those at the bottom of the scale who didn’t march with the Reaper. Lyria’s family were miners, cast out into refugee camps once the overseers were overthrown in turn. With nowhere to go, and no prospects, Lyria’s initial existence is an indictment of Darrow’s new society, at the cusp of where ideals run headlong into the wall of reality. Fiery and determined, Lyria ekes out her days in a refugee camp, with never enough food, and with the eve-present threat of violence. Where society is invested in grand conflicts, people like Lyria have fallen through the cracks. I have a lot of time for Lyria. She’s sympathetically portrayed, someone who has been a victim of circumstance, forced to suffer the agonies brought about by the choices of others. But the grit that sustains her, the unwillingness to accept that her new life is all there is, makes her soar. If Darrow is the voice of freedom, then Lyria is that of the freed, asking difficult questions and unwilling to accept platitudes for answers. Things have become more complicated since the first series ended, and Lyria is the avatar of that complexity. In some ways naïve, but with a remarkable inner strength and a great deal of potential, she’s more than a little broken, utterly unwilling to give up, and an absolute delight to read. Ephraim is something else entirely, another voice from the lower strata of the new social order. Once a resistance fighter, he’s now disillusioned, unwilling to commit to ideals which seem to have a cost too high to pay. The cynical, world-weary shell he projects serves as a fortress, a means to contain the damage that failed ideals and their consequences have had on his soul. But Ephraim’s quiet desperation is intriguing, and his loyalty and affection for his team is undeniable. That his team are high-priced burglars without much in the way of moral scruples is, to be fair, also undeniable. Ephraim’s exhaustion, his willingness to cut corners and make deals, shwos him as another casualty of a society in spasms. But his quick thinking and backing of his friends gives him a sympathetic veneer that helps him stand in the swamp of his own bad decisions. Here is a tarnished paladin, one with noir coursing through his soul, whose wry, cynical voice works alongside Lyria’s passionate calls for justice, both antidotes to the uncaring, blind face of high ideals and high politics. What’s it all about, though, Iron Gold? What’s it like? Well, as ever, I’ll try and avoid spoilers. But I’ll tell you this. It’s got some absolutely amazing scenes, ones which made me swear out loud on my commute, and, in one memorable case, miss my stop because I refused to stop reading until I found out what happened next. This is a story which will grip you, look into your eyes, and refuse to let you go until it’s done being told. There’s some truly amazing combat in here, if that’s your thing – from hand to hand violence with knives and axes, through back alley brawls with blood on the cobbles, to railguns and orbital strikes. It’s explosive, frenetic, energetic and kinetic. But around these moments are quieter ones; not all change is backed in blood. Relationships are built and founder. Betrayals, real and imagined, are constructed in a delicate filigree of social nuance which seeps off the pages and makes the world of the Reds, Golds and everyone else in between, feel alive. There’s some high politics, looking at the very shape of a future society – and there’s low politics, in the form of bribes, grubby compromises, and murder. This is also a book which isn’t afraid of consequences, and is unwilling to pull punches. No-one is safe, and that sense of fragility means that each page is an opportunity for an indrawn breath to turn into a sigh of relief – or not. It’s also a book about people. About Darrow and Lysander Au Lune, sure, but also about Ephraim and Lyria, and everyone around them. It’s a book exploring the meaning of family, looking at the virtues and vices which make people, well…people, in all their messy, confusing torment and grace. It’s a storyy willing to make incisive points, and to rip your heart out, to ignite an incandescent flame of wonder, and work its hardest to sustain it. If you can’t tell, I really enjoyed Iron Gold. If you’re new to the series, it’s accessible, but I’d suggest working forward from the original, Red Rising. If you’re already a Pierce Brown devotee, then you’re in for a wild ride. It’s one which will make you question your assumptions, and one which will reward your attention and your commitment. It’s fast paced, snappy, clever, emotional, and deeply human. It’s the sequel you’ve been waiting for. Read it. Now. A Time Of Dread: Blog Tour, Extract and Review!